Resilience is defined both as “the capacity to recover quickly from difficulties” and as “the ability of a substance or object to spring back into shape.” While I know through firsthand and client experience that you can be resilient even if you don’t “recover quickly”— and actually, from a moxie perspective, I would measure success more by your ability to heal and expand in the face of difficulties than by the speed with which you can again pass as your normal self — I’m particularly fond of the second definition. I’m not sure about you, but I don’t default to thinking about tough times as an inherent springboard back to my best self. Yet opportunities that cultivate our resilience can be such springboards for us — for you. That is why embracing (versus taking cover from or bearing down on) your bum-bum-biting moments is one of your most direct pathways to stepping into your moxie. Because moxie is choosing to be brave, speaking up, and disrupting the status quo, I believe you actually need your bum-bum-biting moments to automatically (or at least, more frequently) choose moxie in the pedestrian moments that define your day-to-day. That bears repeating, so I’ll say it again. You actually need bum-bum-biting moments in order to step into the fullest expression of your moxie. Here are some of the specific gifts you unwrap when you choose moxie during these episodes in your life. One of the top ways that resilience strengthens your moxie is by forcing you to tap into your creativity. For whatever has gotten you through similar episodes in your past is often not what gets you through your current situation. And that is precisely why the situation has shown up — for your evolution. Navigating through a bum-bum-biting moment can be a creative process, if you let it. Creativity can be finding that new, renegade way to solve your crisis, or it can be patching together resources when, at first glance, you deem them in short supply. You can also cultivate creativity by choosing to narrate your experience as a chapter about your highest learning and growth — rather than one about loss or failure. 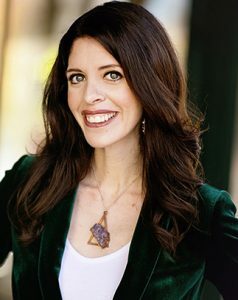 When you choose resilience and, as a by-product, moxie, you are also by default growing your capacity to empathize, which is a superpower when it comes to connecting with others, positioning yourself as someone who is relatable and trustworthy, and empowering other people to heal from their pain and be their best selves. When I read testimonials from my coaching program participants, I’m grateful to discover that many have commented on my ability to really see and be in their experiences with them. Now, if you are a therapist, undoubtedly that makes you want to cringe. And I assure you, I do not take on anybody else’s “stuff” as my own — at least, not anymore. (Okay, sometimes I still do, but so much less than I used to.) For when you’ve lived through your own fair share of bum-bum-biting moments, it does grow your ability to empathize with others through their painful episodes and to more adeptly hold space for them as a result. Some people choose to be private about their bum-bum-biting moments, a practice that unfortunately usually breeds both secrecy and additional suffering for the bite-ee. However, those on the moxie path allow setbacks (irrespective of their magnitude) to heighten their truth telling — to themselves, first and foremost, and to others — professionally and personally. You cultivate transparency when you are honest about where and how you are hurting (especially when you aren’t asking people to fix you and want them simply to hold space for your experience). And when you admit that you aren’t perfect, that you don’t have it all together, you also fortify yourself against perfectionism — and perfectionism must be slayed in order for moxie to thrive. When you unapologetically own that you cannot and therefore won’t attempt to power through difficult times alone, you open yourself up to receive support — something that is hard for a lot of women to do (including the one who is typing this out for you). While many women may feel, and at times complain, that nobody takes care of us, the truth is that most of us aren’t asking for the support we need on a regular basis. As a consequence, we are getting in the way of attracting, and when it’s offered, accepting, other people’s help. (Remember our discussion in the last chapter on articulating and upholding boundaries?) Bum-bum-biting moments are fertile ground for strengthening your capacity to ask for and receive support from the people in your life — mates, children, extended family, friends, colleagues, community members. And, when you practice asking the question, “What am I supposed to learn?” without secretly wishing for a quick answer, you also enhance your ability to receive divine guidance, which is, in my humble opinion, the greatest gift we can invite and accept into our lives. Self-awareness is the ability to see the truth of ourselves — the good, the bad, and the truly baffling — with compassionate clarity. When you are self-aware, you squelch any and all desire to critique yourself for who you are (and who you are not…yet) and instead, you simply observe and appreciate who you are in the present moment. Resilience does this to you, for you. Because at its core, resilience, like forgiveness, is about making peace with what is rather than holding on to the hope of who you, others, or a situation could have been. As a by-product of resilience, self-awareness activates the fullest expression of your moxie. For when you learn to speak to yourself and others as you/they are, from a feeling of enoughness, your communication will flow clearly, easily, and compassionately. children or partners, or have suffered unspeakable abuse (often at the hands of those closest to them). A huge part of resilience for these women was realizing that their survival and the lessons they have learned must be shared. This is a discovery I suspect you may have had as well — that what you have survived can provide inspiration, insight, and healing for others. 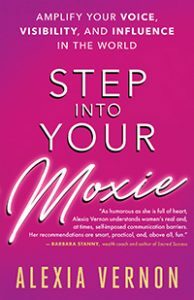 Excerpted from the book Step into Your Moxie: Amplify Your Voice, Visibility, and Influence in the World. Copyright ©2018 by Alexia Vernon. Printed with permission from New World Library — www.newworldlibrary.com.